To me, lighthouses are a special sign of home, not only because I grew up on an island in the Baltic: Their beaming light can be seen from afar, and it guides through the darkness. 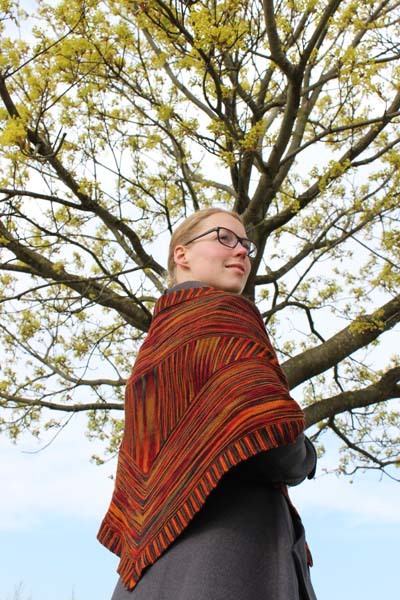 This was exactly what I had in mind when designing this pattern: May your Leuchtfeuer shawl warm and protect you – and shine, not only at night! Leuchtfeuer is a symmetrical stockinette half-circle shawl, that looks equally pretty from both sides – yet no difficult techniques needed! 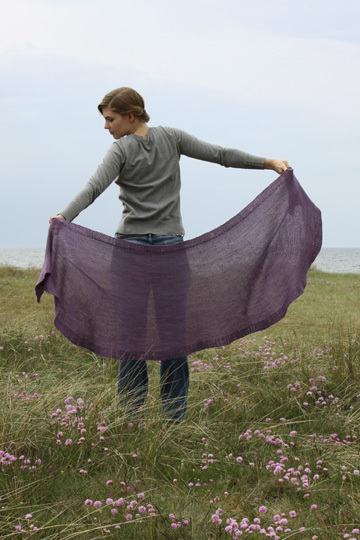 The construction is easy: The entire shawl is completely knit in the round without a single purl stitch; as a last step, both edges are bound off together – that’s all. The fold ensures that both sides lie on top of each other and produce a double texture that protects from cold wind and draft. 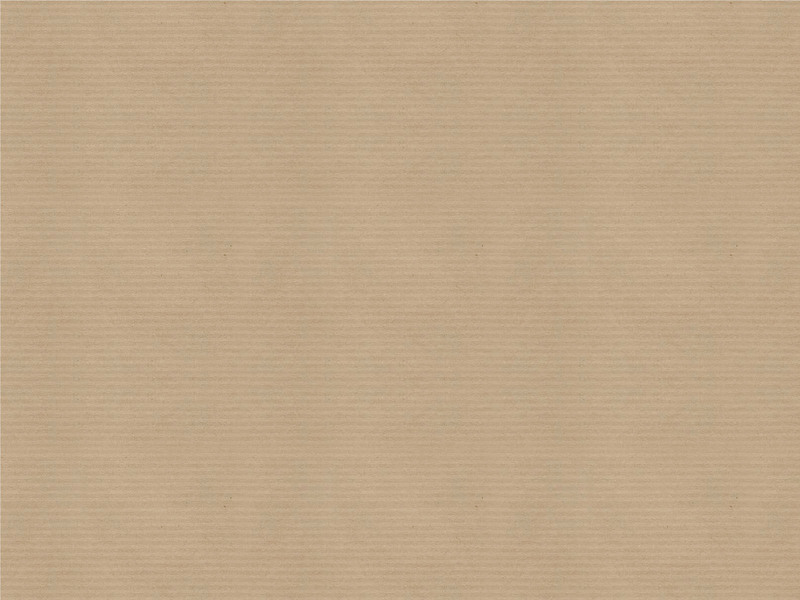 I chose the simple yet effective stripe pattern because it reminds me of a lighthouse’s light beam at night. 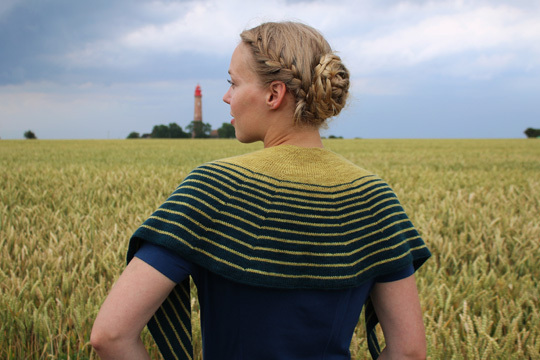 Leuchtfeuer was the September design for the “Miss Babs Knitting Tour 2014”. I was taking the club members on a trip to North Germany to enjoy the wild beauty of its autumnal coastal landscape. So what would have been more obvious than making a stop at a lighthouse (“Leuchtfeuer” in German)? There are also millions of other options to use this pattern: Combine different colors, yarns and stitch patterns (e.g. Fair Isle…) the way you like – enjoy! For further information please visit my ravelry page. Happy knitting! 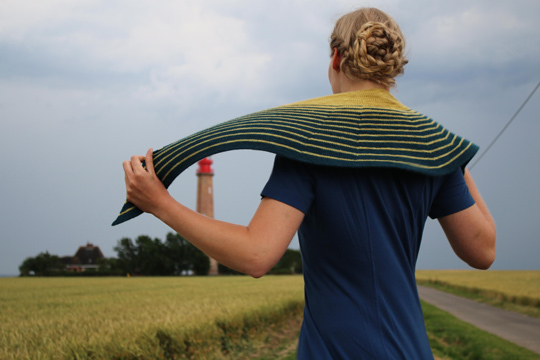 Segel (English: sail) is an elongated bias-shaped shawl, that looks like a sail. Due to its double thickness it is equally pretty on both sides – yet no difficult techniques needed! 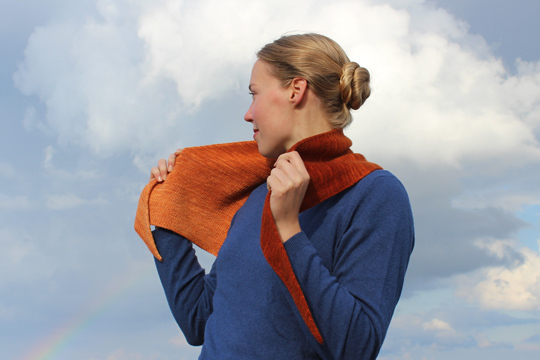 Segel is completely knit in the round without a single purl stitch; as a last step, both edges are bound off together – that’s all. And the best: No curling edges! The folds, that are worked as you go, ensure that both sides lie on top of each other very well, while producing a double texture that protects from opposing wind. This special construction gives ample scope for your creativity! 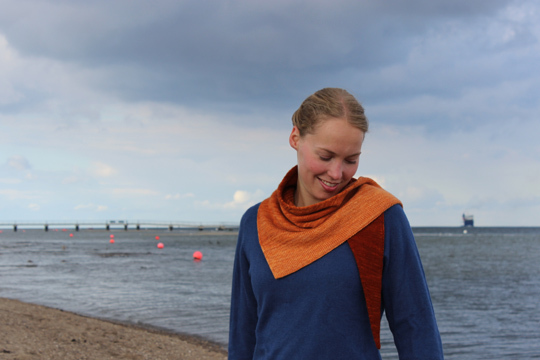 I really loved the idea of making a sail in a gradient look using the Miss Babs Gradient Set. There are also millions of other options to use this pattern: Combine different colors, yarns and stitch patterns (e.g. Fair Isle…) the way you like – enjoy! Sandbanks are small islands of calm, that are washed around by the churning sea. 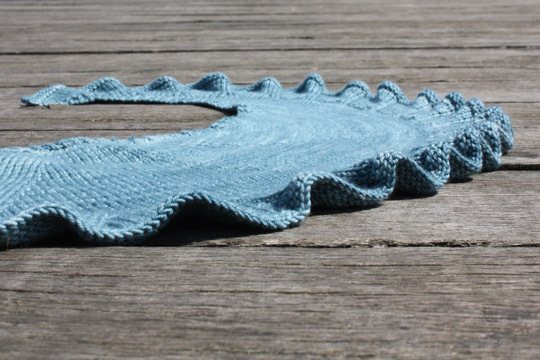 Not only my shawl’s shape reminds me of sandbanks, but also the ornamental edge pattern. 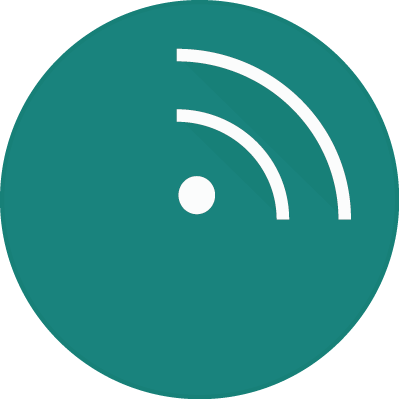 It has a crescent shape that is completely knit in the round. 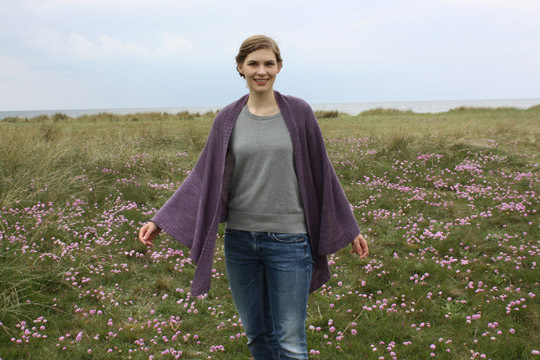 I prefer wearing the shawl as a cardigan in a casual way, but it also makes a wonderful wrap for an evening on the beach. Since you start with an invisble cast on in the centre, most of the stitches are knit stitches. 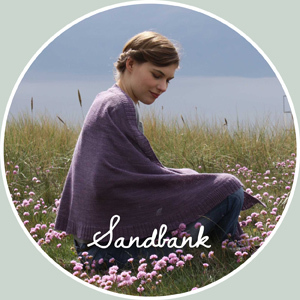 Except from occasional increase and decrease rounds, the biggest part of my Sandbank shawl is totally relaxing to knit due to all of the rounds in stockinette stitch – just like an island of calm. A few weeks ago, I found Abendroth Porzellan here in Kiel: They have a lot of cute handmade things, that are both delicate and filigree. I really like combining the fine porcelain with the structure of something handknitted. 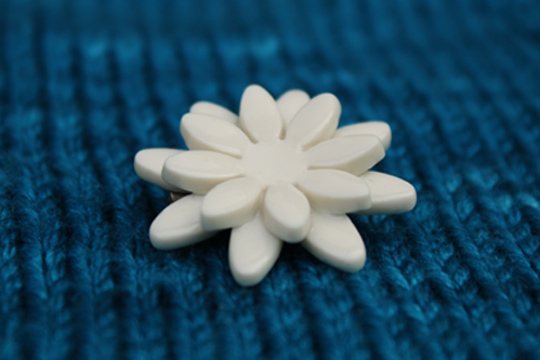 Since I fell for the scarf pins, I chose one for my sister as a birthday gift – she can either wear it as a shawl pin or just accentuate the knitted fabric with it. 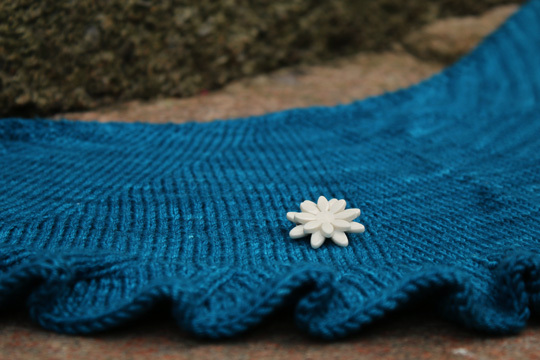 I photographed the brooch on her Mien Deern shawl (beautiful silky and shimmering Merino Dk by DyeForYarn). Abendroth Porzellan can not only be found at the brick and mortar store in Kiel, but also on Dawanda. Somestimes, when the wind is very strong, I wish for a shawl that is thick and warm but makes me look feminine as well. “Mien Deern” means “my girl” in Low German. 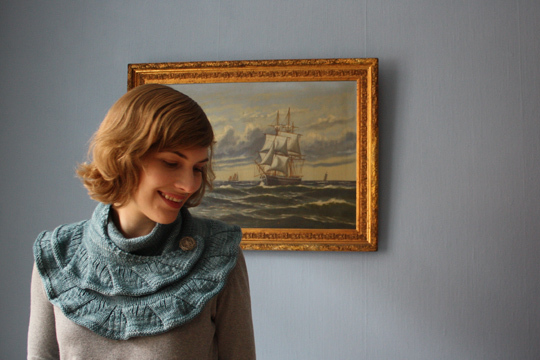 This shawl is reminiscent of a “Deern”: It’s playful and easy, but due to the DK yarn a little bit rustic, too. 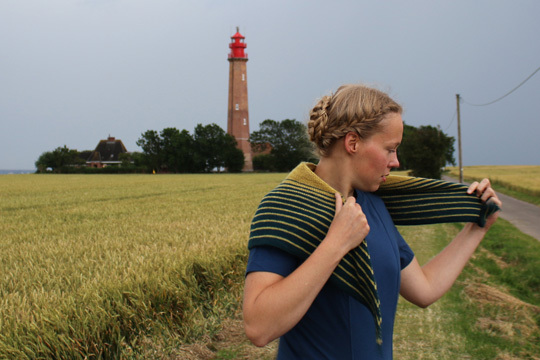 When designing this shawl, I focussed on two things: I wanted to create a shawl with ruffles that are well defined and edges that don’t curl – even when being worn frequently. 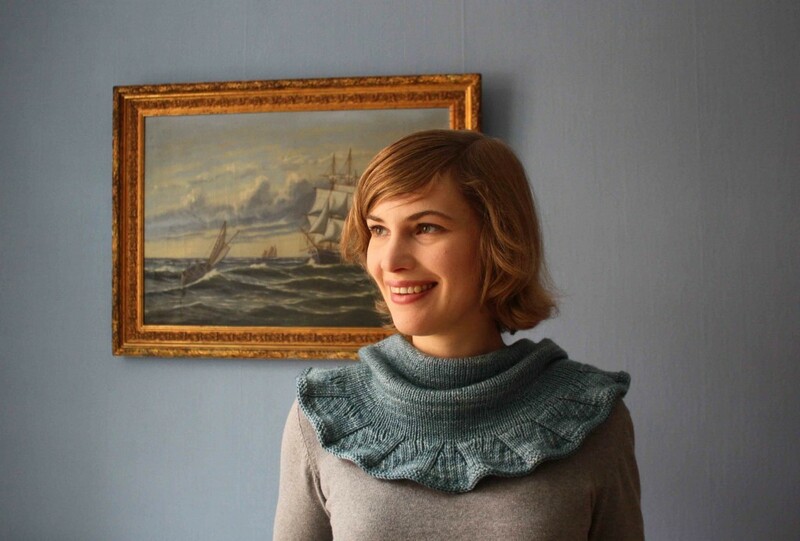 The special thing: If you put the shawl around your neck, all of the ruffles will drape the way they are supposed to be. By the way, there are no special techniques required to knit this shawl, it’s totally suitable for beginners as well. For further information please visit my ravelry page. Happy knitting! 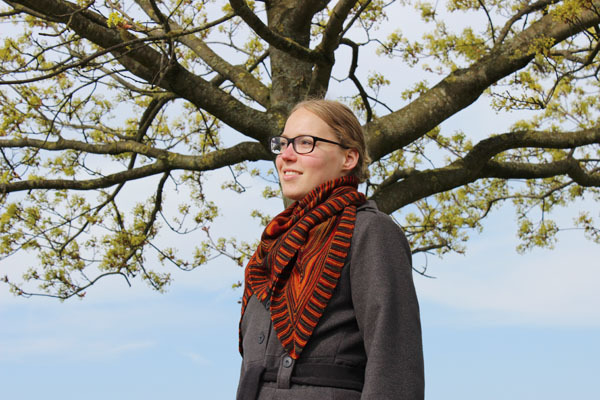 Nordnordwest and “Raku Regenbogen” lace are a perfect match – I love this shawl!